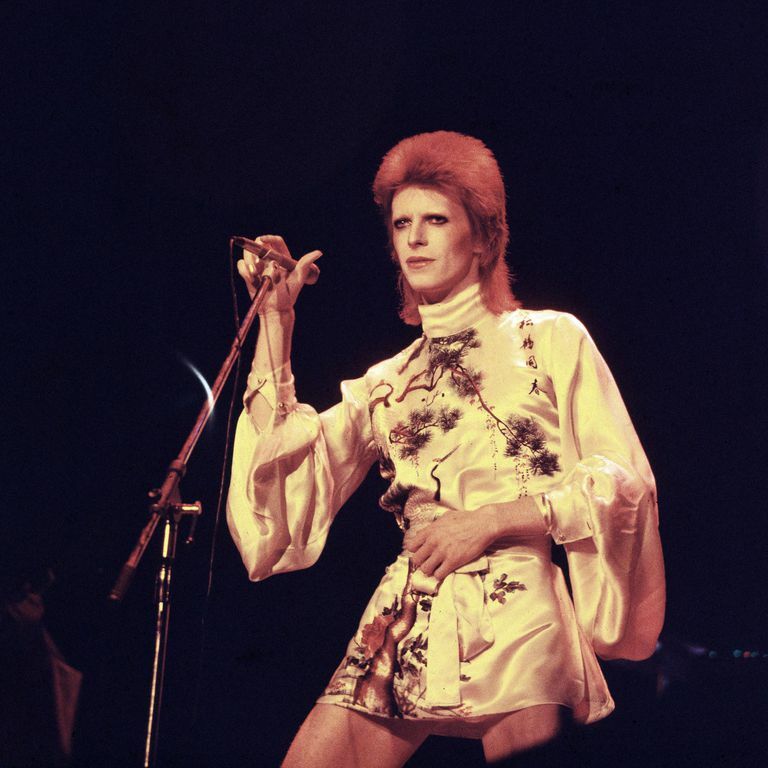 With a career spanning six decades David Bowie had long cemented himself as pop culture’s most fashion-forward music icon. 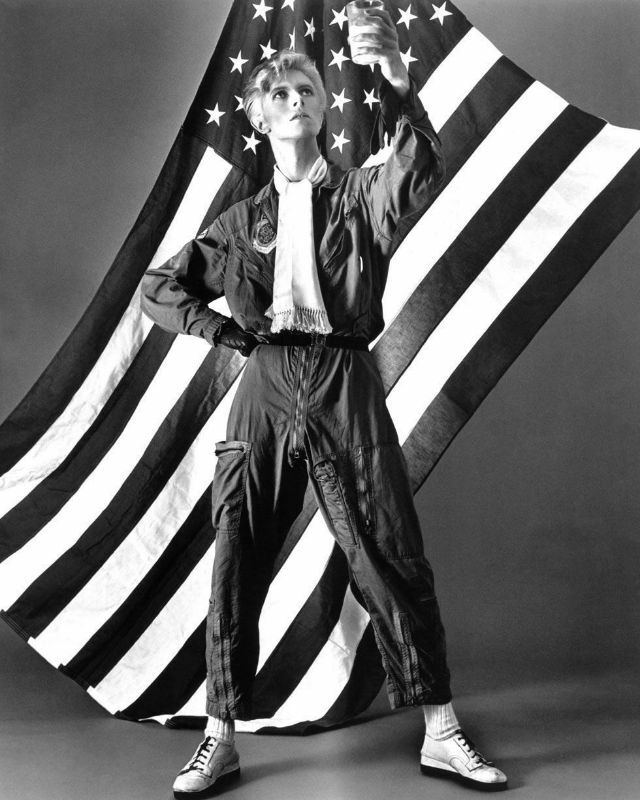 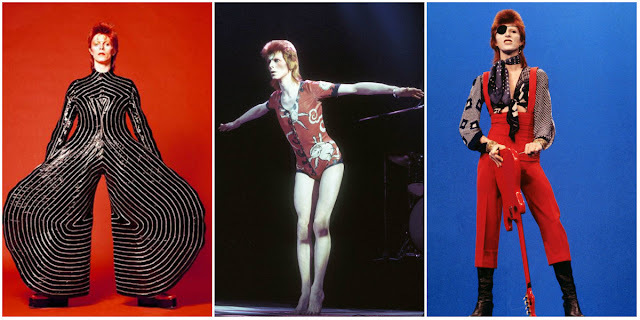 From his emergence as a monochrome teen mod in the 1960s, to the glitter-soaked, gender-bending explosion as Ziggy Stardust in the 1970s, and the new romanticism, neo-classicism and Berlin-channelling looks that followed, Bowie is best known for undergoing a style renaissance at every possible turn. 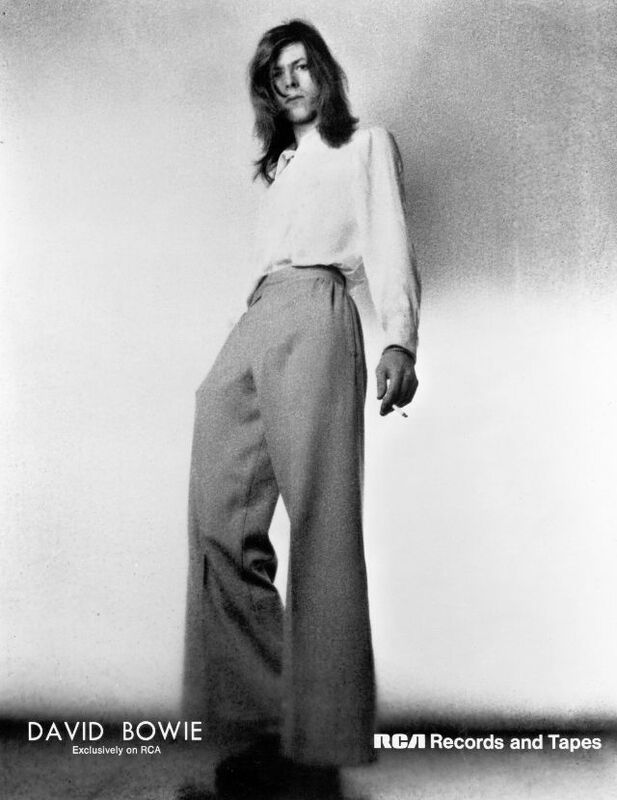 In wide leg pants posing for a portrait promoting the Hunky Dory album in London, 1971. In a striped jumpsuit and platform boots posing for a portrait as Ziggy Stardust in London, 1972. 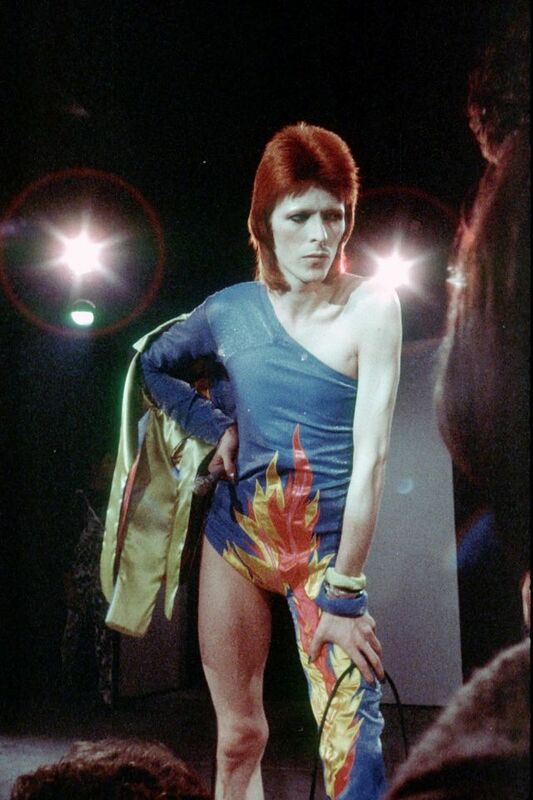 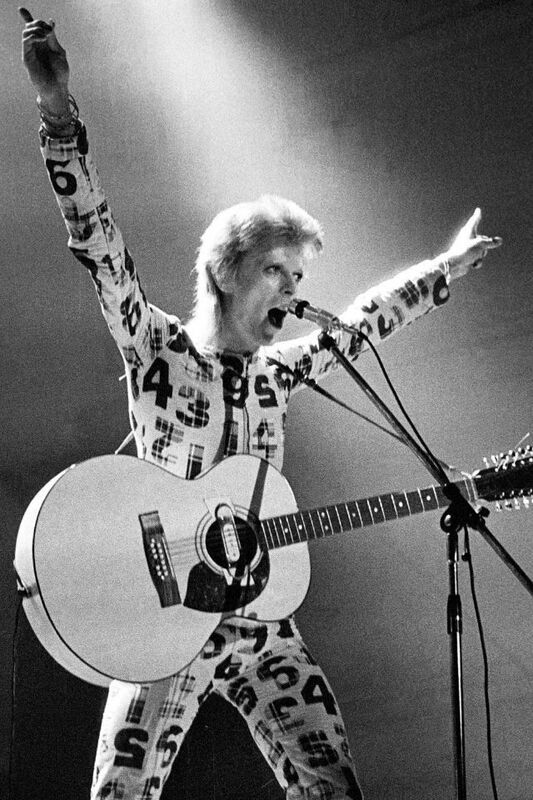 In an asymmetrical bodysuit performing onstage as Ziggy Stardust, 1972. In lace up boots and a printed jumpsuit being interviewed at home in Beckenham, London, 1972. 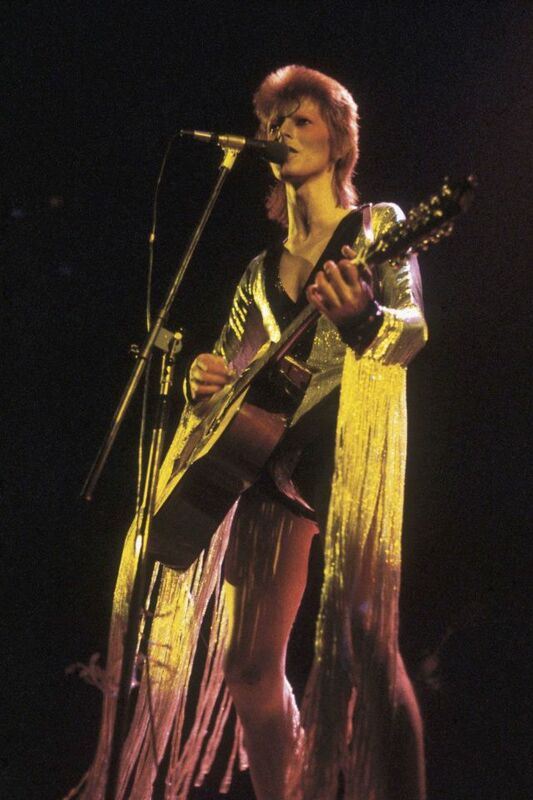 Wearing a fringed number designed by Kansai Yamamoto performing at the Hammersmith Odeon, 1973. 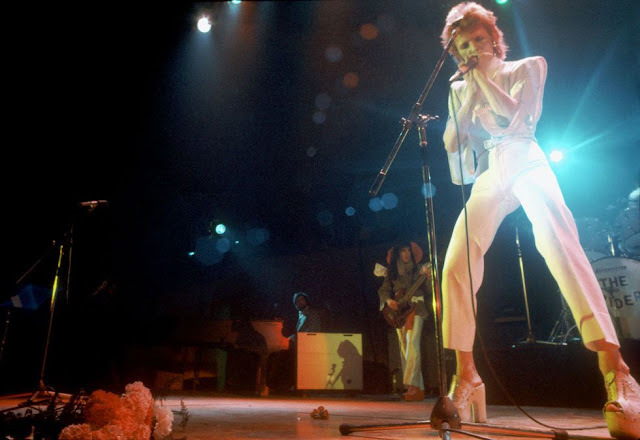 In all-white performing at The Marquee Club in London, 1973. In a number-printed jumpsuit on his Stardust tour, 1973. In a billowing robe performing on stage, 1973. 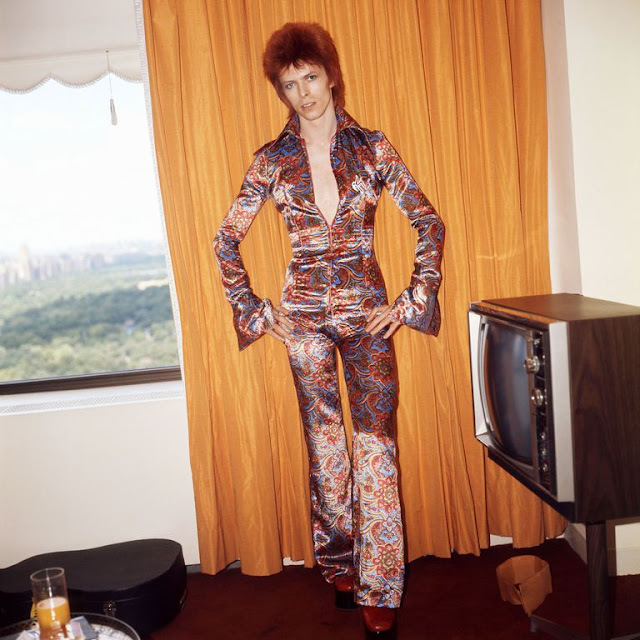 In a colorful quilted set photographed in a New York City hotel room, 1973. 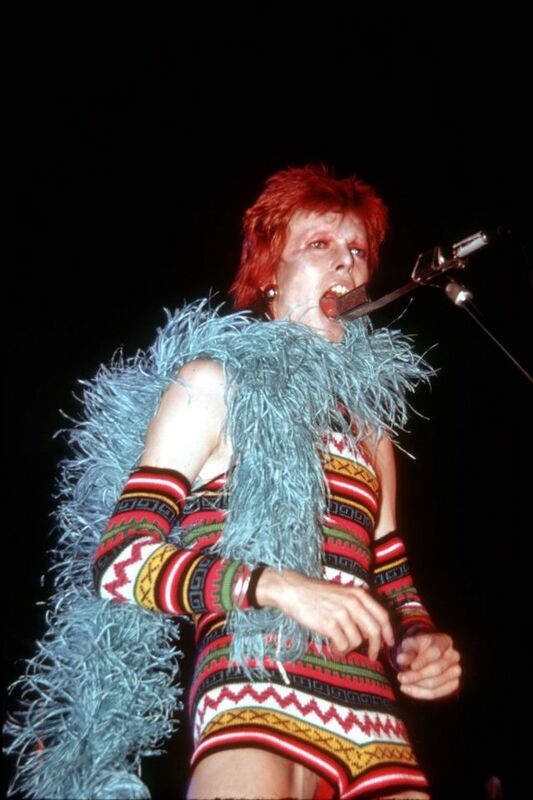 In a blue feather boa performing in Los Angeles, 1973. 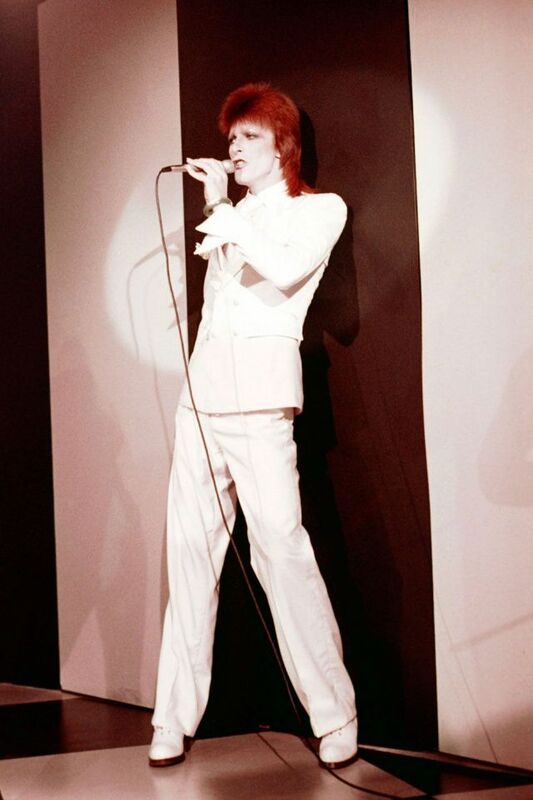 In an all-white look performing in Los Angeles, 1973. 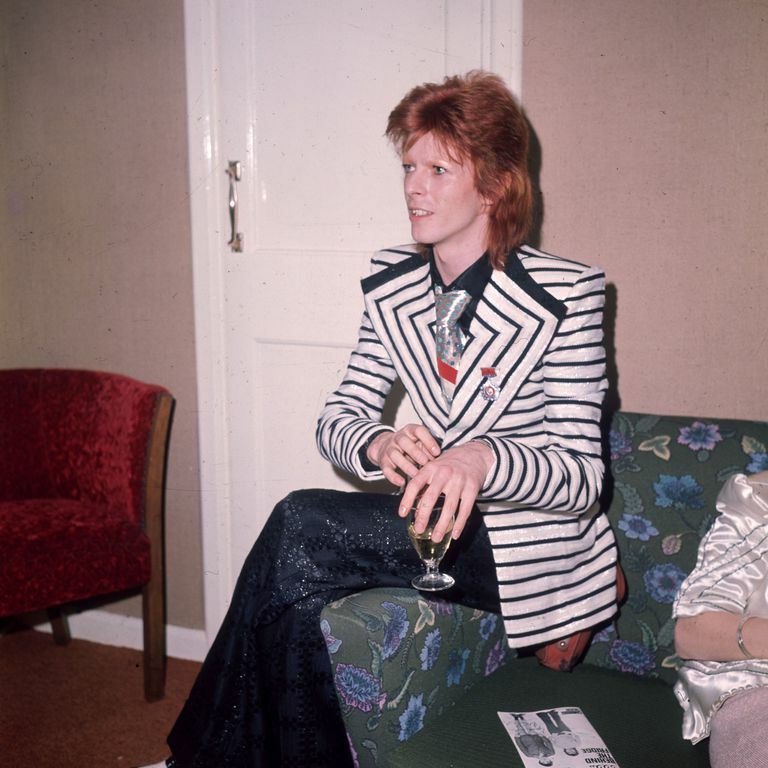 With designer Kansai Yamamoto, 1973. 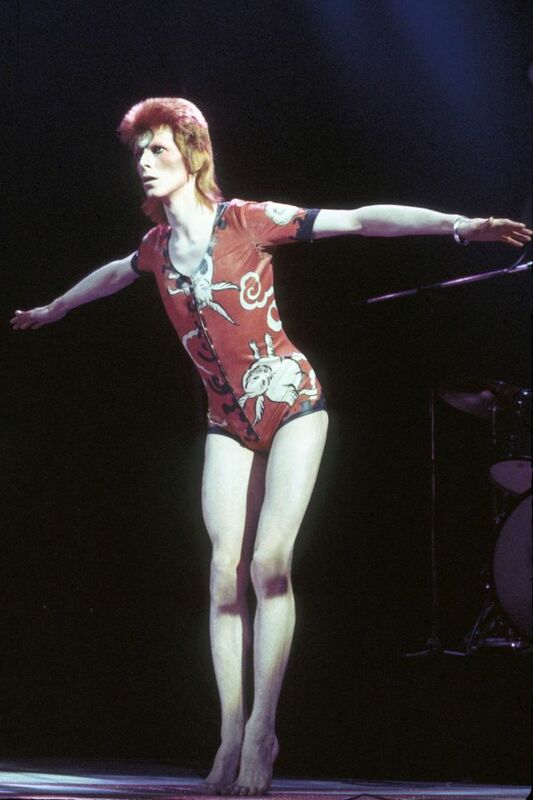 In a Kansai Yamamoto-designed bodysuit performing at the Hammersmith Odeon, 1973. 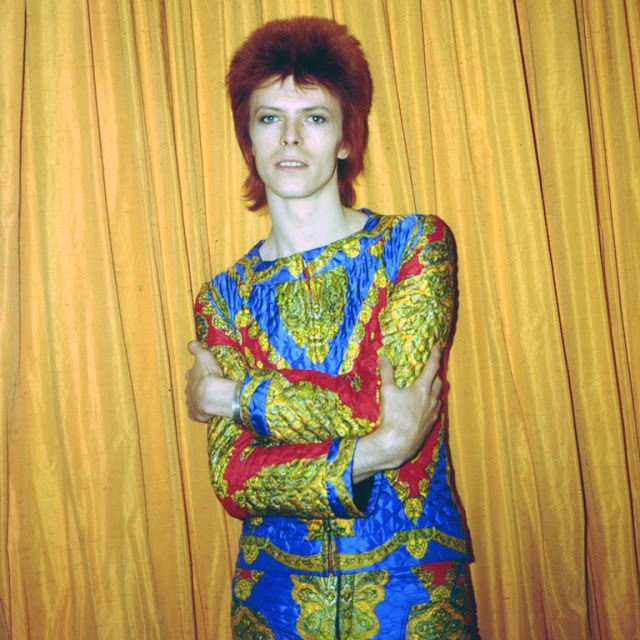 In a silk flared jumpsuit posing for a portrait in New York City, 1973. 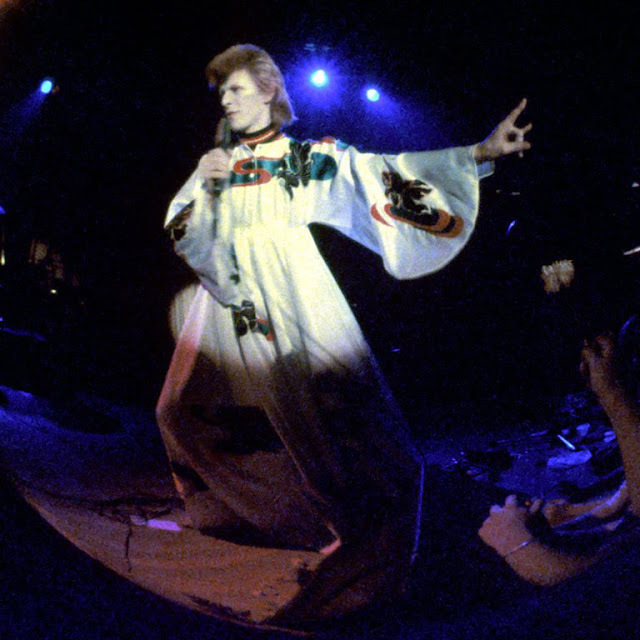 In a printed mini dress performing on his Ziggy Stardust/Aladdin Sane tour in London, 1973. 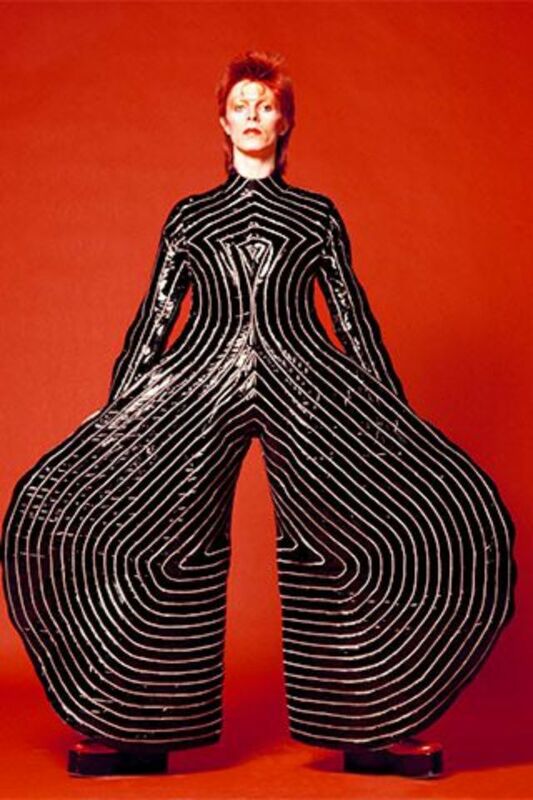 In a look by Japanese Designer Kansai Yamamoto, 1973. In a striped blazer with wide lapels caught candid, 1973. 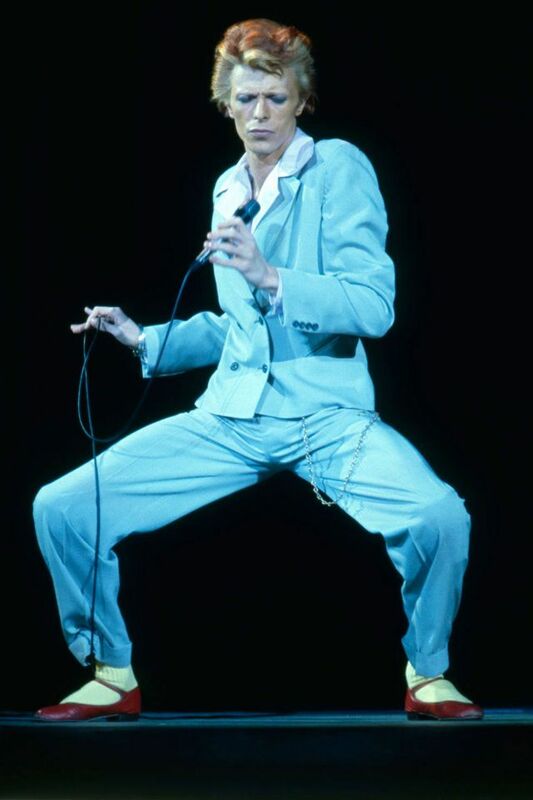 In a blue suit performing in Los Angeles during his Diamond Dogs tour, 1974. 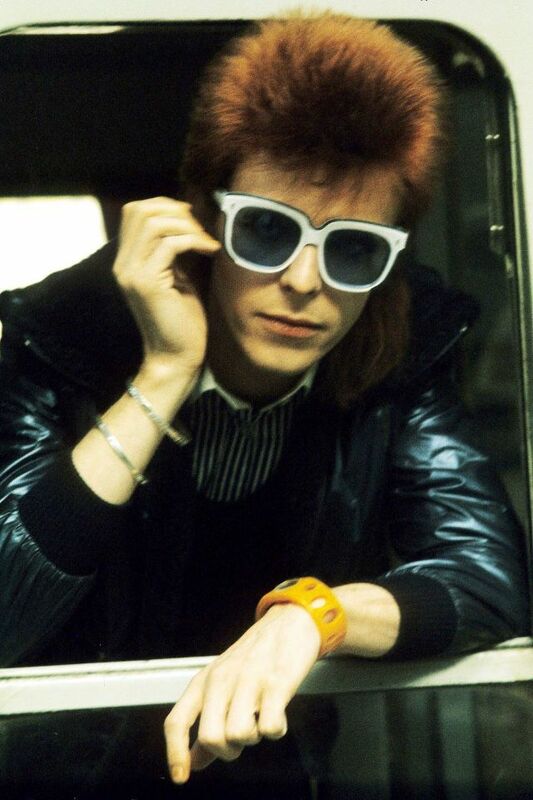 In sunglasses, pictured in England, 1974. 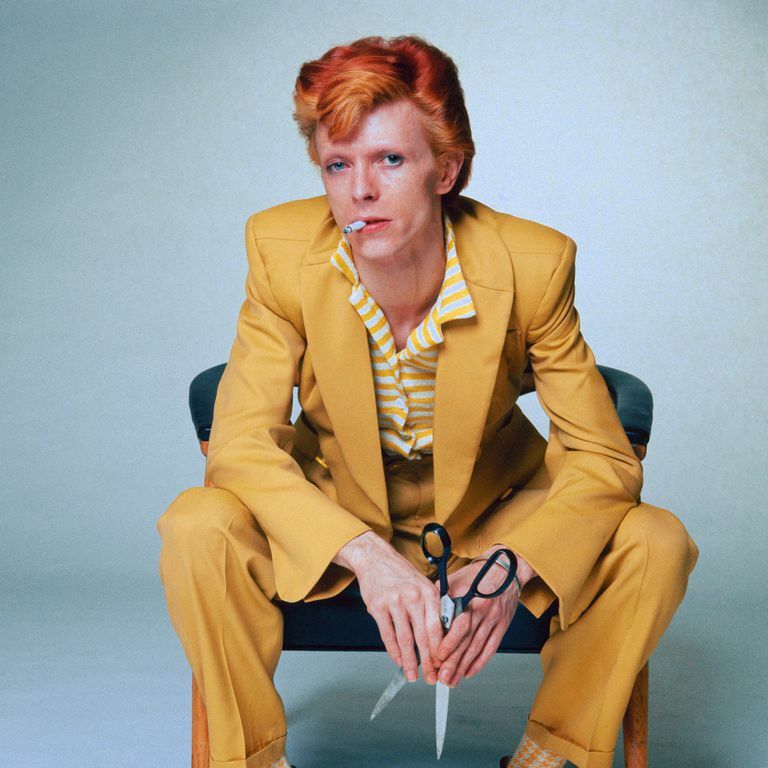 In a yellow suit for a promo photo, 1974. 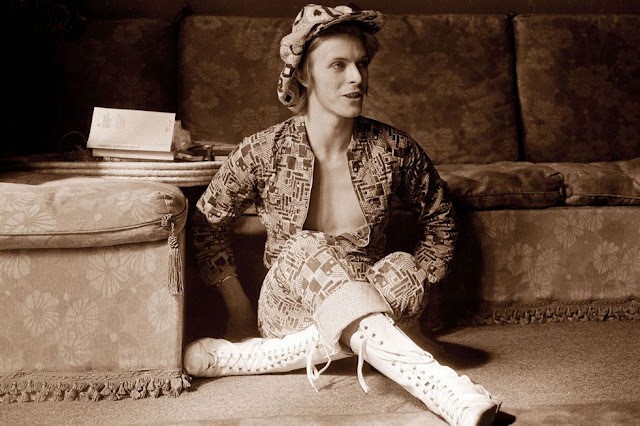 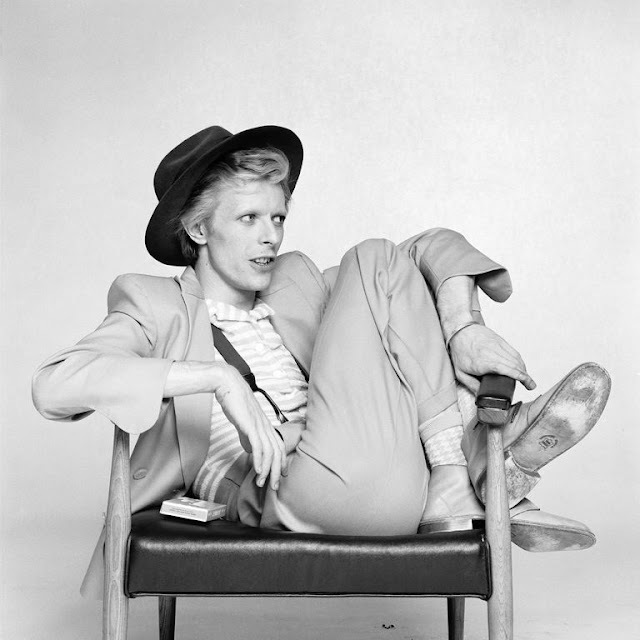 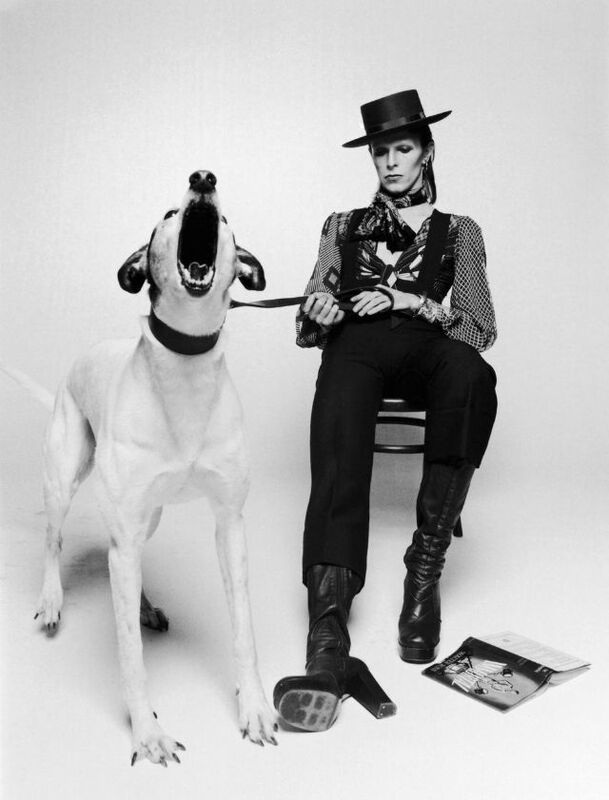 In a top hat, heeled boots, and overalls posing his album Diamond Dogs, 1974. 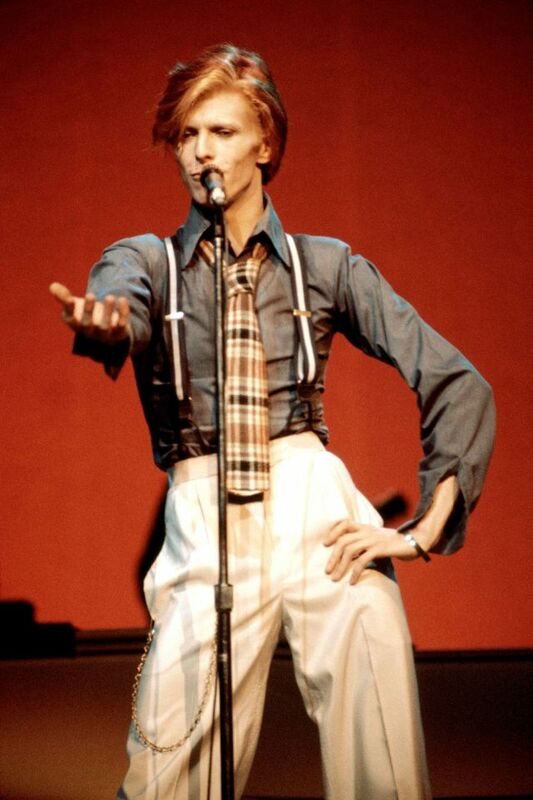 In suspenders and a plaid tie performing at Radio City Music Hall during the Philly Dogs Tour, 1974. 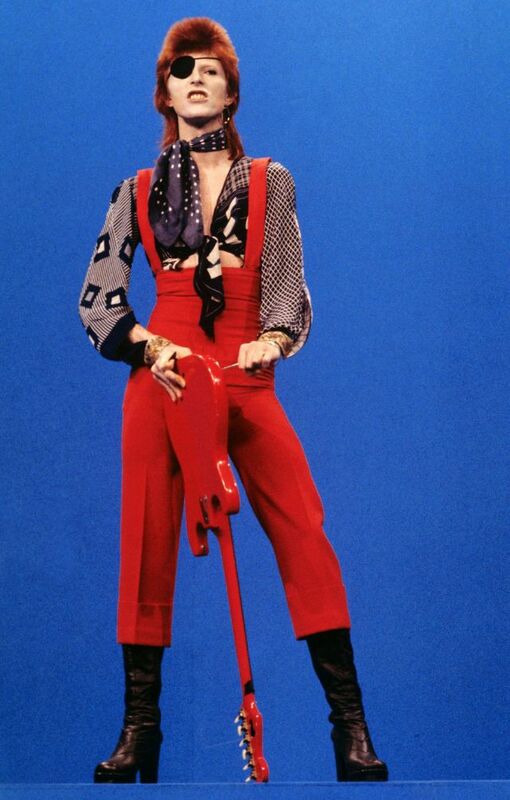 In an eye patch and red overalls performing "Rebel Rebel" on the TV show TopPop in Hilversum, Netherlands, 1974. In a suit and wide brim hat for a promo photo, 1974. 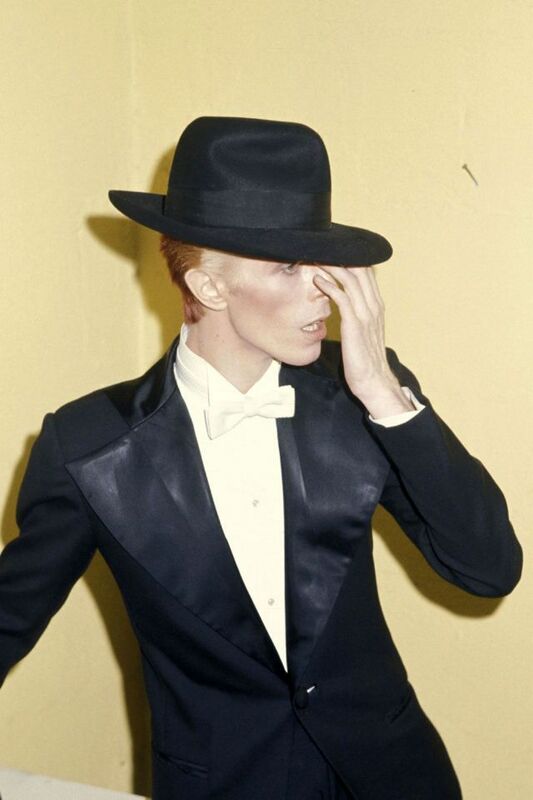 In a fedora and suit at the 17th Annual Grammy Awards, 1975. 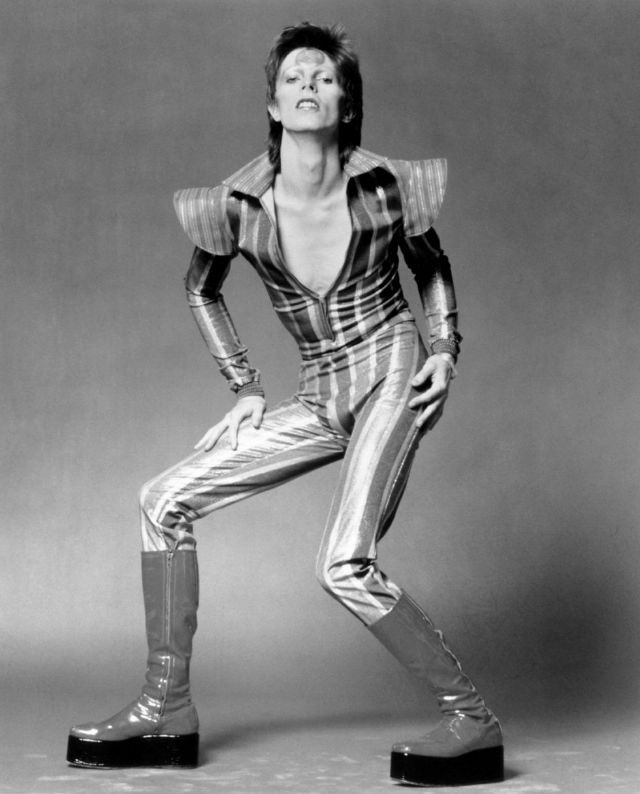 In a jumpsuit and sneakers posing for a portrait, 1976. 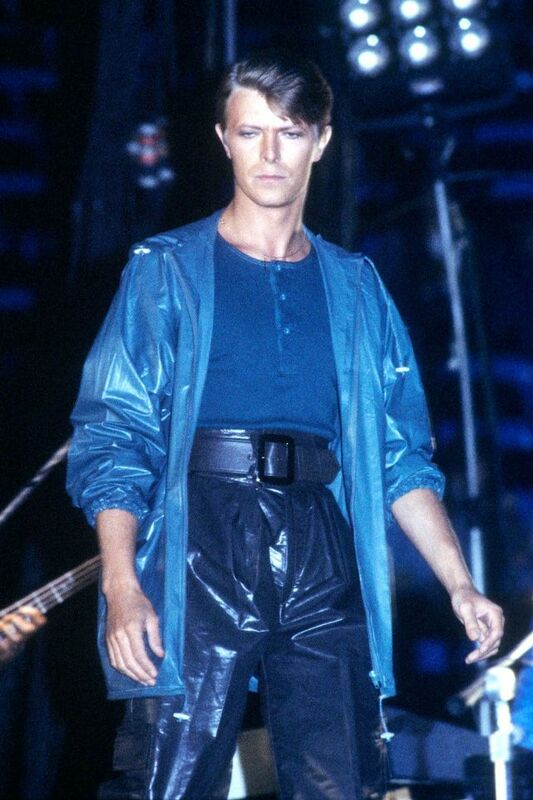 In pleather pants performing in Oakland, California, 1978. 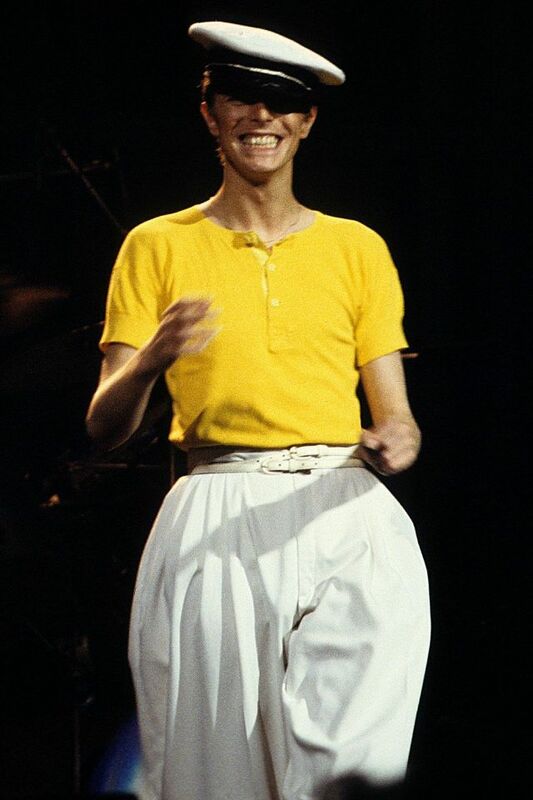 In a sailor cap and parachute pants on his Low/Heroes tour at Madison Square Garden, 1978.